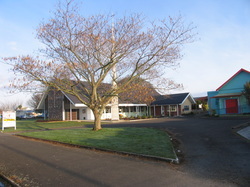 St Matthew's was the first church in Morrinsville and has a long and proud history. The first St Matthew's was built in 1895, and at that time it was the only church in Morrinsville. The present building dating from 1959 was designed after a Church in Townsville, Queensland, Australia. It is widely supported by the wider community. Our Carol Service, where we are joined by other choirs in the town, and Easter Services are big events, as are funerals. People describe the church as being a beautiful building in a beautiful town. In May 2011 we opened a new and spacious office. We are open Tuesday and Friday mornings so come and say hello! The hall was refurbished in May-August 2013. It was given a new paint facelift with repairs and replacements made to wall boards where necessary. New carpet has been laid and cupboards and shelves replaced. The Op-shop is open every Friday morning and is open on Market Day (1st Saturday each month), when there are Devonshire Teas held in the Church from 9am. The hall has been renamed 'The Hub' and is in constant use. It is being used for the Op-Shop, Toddlers Rhythm and Dance, Selwyn Centre, KFCC (Kids for Church Club), Family Fellowship and other initiatives. There is a pot luck Community meal every Wednesday evening at 6pm. We feel encouraged and equipped through a variety of worship and events. We enjoy worshipping together with other churches. We believe our purpose in the community is to share the Gospel, reach out with love to the wider community, to reach out to children and young families and to be the Anglican Centre of Morrinsville.